A lot of people call your music one of the first albums of power pop. What does that expression mean to you? 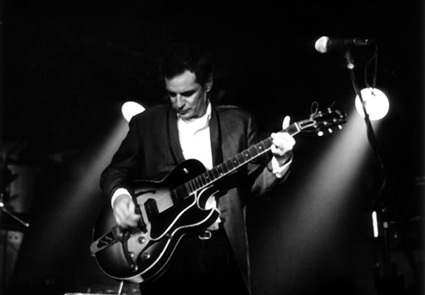 Alex Chilton: Um, I don’t know, really. To me, our band was more like the mid sixties British invasion music. You know, it was three minute pop songs that were unpretentious and basically about love and being a teenager and having a good time. [Music], once it entered the psychadelic era there in the sixties, I became less interested in it. I like simple pop songs with no real message– just about feeling good and being happy. Are you ever on the oldies circuit? AC: Yeah, I played a gig with the beach boys a couple of weeks ago. That was thrilling. I got to even sing “Surfin’ U.S.A.” with them. It was the greatest thrill of my career. So what’s it like for you on the oldies circuit? AC: I enjoy meeting all these bands that I’ve heard of for so long. Like, I played some gigs with ? from ? and the Mysterians. He’s a lot of fun. It’s interesting to be hanging around hotel lobbies with ? and that sort of stuff. In the summertimes, it seems like people offer me some gigs with sixties bands. It’s fun to do now and then. So what do you play? AC: It’s pretty strictly Box Tops material that’s called for. Usually it’s a five song set. So it’s kind of easy money. You get up and play five or six tunes at a county fair in Iowa or North Dakota or something. It’s kicky, you know. What can I say? -Alex Chilton, in an 1991 interview with Terry Gross. Chilton, who found chart success in the late sixties with the Memphis band The Box Tops before forming Big Star, died last Wednesday in New Orleans at age 59.